No more wait for Microsoft Windows 8 first look, Microsoft has officially declared and revealed most awaited version of Windows after Windows 7 codename 'Windows 8'. The Microsoft official event were not streamed live, the video from Computex has now been posted up for everyone to view. The upcoming version of Windows 8 will look a lot like Windows Phone 7. But the familiar PC design is still there to support systems. 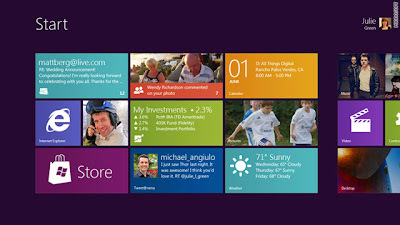 Microsoft revealed the design and UI Demo for Windows 8 at the All Things Digital Conference. Microsoft is now borrowing a page from Apple's iOS and Google's Android. Windows 8 takes the colorful tiles and finger-swipe gestures from the Windows Phone operating system and expands them to a larger screen in this demo, 10.6 inches diagonally. The video goes into detail about Microsoft's next operating system. The video focuses on the tablet interface which shows Microsoft's strategy for combating iOS and Android in the tablet market. In the video, Microsoft Corporate Vice President, Mike Angiulo, takes the stage and shows off the platform in a 32 minute long presentation. 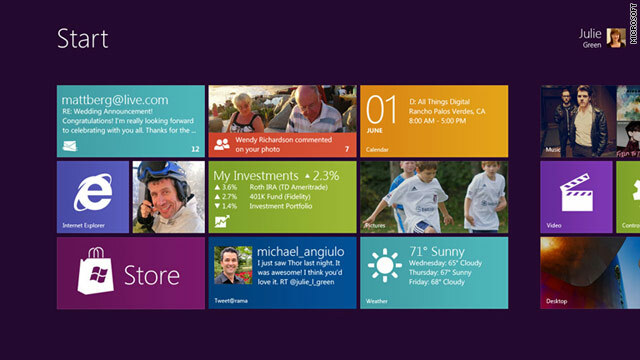 Windows 8 is still in development, so it's unclear how well the system will run on tablets. The demo was silky smooth, but the touchscreen Microsoft used was connected to a hidden desktop computer, rather than contained within the portable hardware. Microsoft says Windows 8 will be able to run on processors designed by ARM Holdings, in addition to Intel chips. That's an important addition because ARM's technology is winning among most smartphone and tablet makers. ARM President Tudor Brown predicted on Monday that his chips will be used in at least half of all mobile devices sold, which includes laptops.